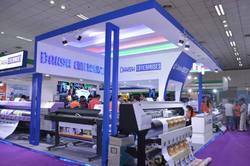 Our product range includes a wide range of 3d wall paper printer and digital door paper skin printer. The printing quality is competitive to the Japanese Wall Paper Printer, Automatic feeding and collecting structure, Two head model with intelligent infrared heater and fan drying system, The machine through different quality tests is stable and competent enough for mass production requirement, 1440dpi overturns the highest resolution of traditional printers which leads the resolution of large format outdoor printing to a new standard. Your new profit pattern will be established and new business opportunity will be discovered. Foggy print, Variable, Wave print. Simple printhead calibration mode can be easily mastered by operators. Optional setting printing origin by auto-induction and manual. Adjustable speed, uni/bi-direction, and step value during printing. Operations both in computer interface and machine control panel. Automatic and constant ink system cleaning function. Options for single head cleaning or double heads cleaning. Options for soft, normal and strong printhead sucking. 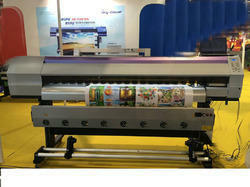 By keeping track with the technological development, we are offering optimum quality Digital Door Paper Skin Printer. We provide this sublimation printer in numerous specifications. Our experts use the finest quality material and leading technology for manufacturing.